WHEN I was a child, I was taken to places like Rutherford House, Fort Edmonton, and other places to explore and learn about Edmonton's history. Robin, the main character in Rutherford the Time-Travelling Moose, also gets to learn all about Edmonton's history, first-hand. 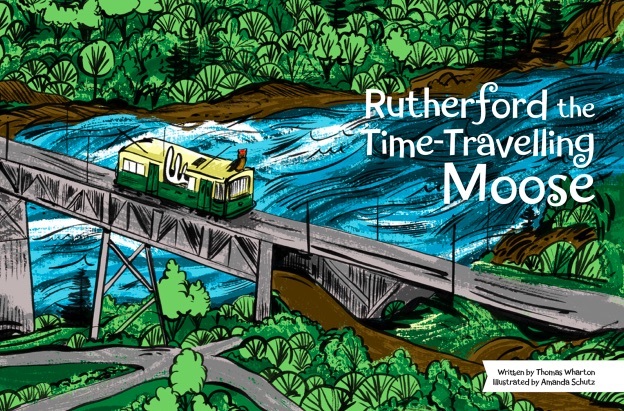 Written by acclaimed Edmonton author Thomas Wharton and illustrated by local designer Amanda Schutz, Rutherford the Time-Travelling Moose is a whirlwind adventure through the city's history, aimed at young children. When Robin visits Rutherford House with her grandmother, Rutherford (after whom the book is titled) appears. The moose takes Robin to different places and eras, starting with the ice age. Robin is introduced to historical figures and sees how the city has changed over the centuries, before Rutherford brings her back to the present day. The story and the pictures are a lot of fun, and it really is great to see a storybook like this for Edmonton. Even as an adult, I enjoyed seeing the artistic renditions of how places I frequent, like Whyte Avenue, looked like in the past. And, how very Canadian for the time-traveller to be a moose! I definitely plan to pass the book along to a child and hope they will enjoy this fast-paced introduction to Edmonton. Eat A Little, Help A Lot!